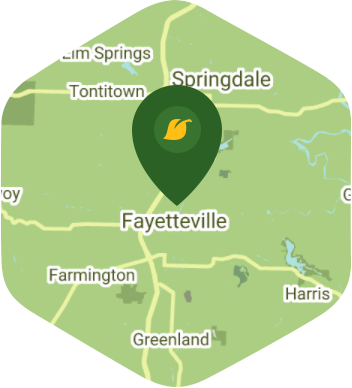 Book a skilled lawn pro in Fayetteville. Backed by a total satisfaction guarantee and amazing customer support. A lot of people seem to think of Southern cities as nothing more than "sleepy little towns", but this is not always the case, and Fayetteville is proof of this. It is home to the University of Arkansas, the largest university in the state. The city has so many things for you to do and places to go to, and it has been named as one of the South's best places to visit. As a homeowner here you know everything about what makes your city great, but you can't find the time to enjoy any of them because of your yard care duties. Well leave the yard care duties to the pros from Lawn Love because this is a job that we'd love to handle for you. We understand that life and your other responsibilities can get in the way of your yard maintenance, but that's okay because it's what we're here for. Lawn Love is a fully insured and bonded company, and we have only the best and most experienced independent lawn pros on our team. They can clean up and take care of your yard no matter how big or small it is. Give us a shot by requesting for a free online quote, or you can also call us at 501-406-2264. Loved how he took care of our lawn. Looks healthy, puffy and ready for summer! We're loving Lawn Love! Rated 4.75 / 5 stars in 100,615 Lawn Love customer reviews. It looks like the expected precipitation in Fayetteville is 0.26 inches, which means your lawn got a nice soaking—leave those sprinklers off today. Dusk and dawn are the best times to water your lawn (the sun will rise at 6:33 AM and set at 7:56 PM today in Fayetteville). Here are some average lawn care prices for homes in Fayetteville. Average lawn size 4,537 sq. ft.